Mon, Feb 4, 2019, 08:20 pm SL Time, ColomboPage News Desk, Sri Lanka. 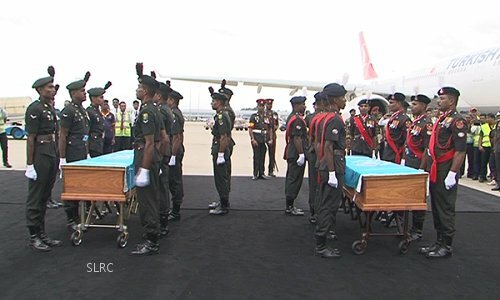 Feb 04, Colombo: The bodies of Sri Lankan UN peacekeepers Major W.D Jayawickrama and Sergeant S.S Wijayakumara, who were killed during a mine attack in Mali while serving the UN Peacekeeping Mission in Mali (MINUSMA), were repatriated on Monday (4) afternoon. The plane carrying their bodies arrived at the Bandaranaike International Airport in Katunayake this afternoon, where the UN flag draped coffins were received in a dignified ceremony with a distinguished gathering in attendance. A fitting military parade in the presence of the Commander of the Army, UN Resident Coordinator, UN Force Commander, MINUSMA, Sri Lankan and MINUSMA Officers, Colonels of the Regiments, Directors, Regimental Sergeants and a representative gathering of all ranks accepted the remains of the two UN peacekeepers. 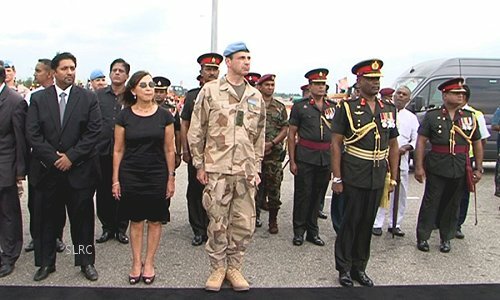 Lieutenant General Dennis Gyllensporre, Force Commander, MINUSMA formally handed over both UN flag-draped coffins to the Commander of the Army, Lieutenant General Mahesh Senanayake. A solemn red-carpet ceremony paid tribute to the invaluable overseas service, both of them performed on behalf of all Sri Lankans. Troops presented a salute to the coffins laid on gun carriages before taking the remains to the Negombo Hospital for post-mortem and other formalities. State Minister of Defense Ruwan Wijewardene, UN Resident Coordinator, Ms. Hanaa Singer, close next of kin of the fallen war heroes, MINUSMA delegation and senior military officers were present at the ceremony.